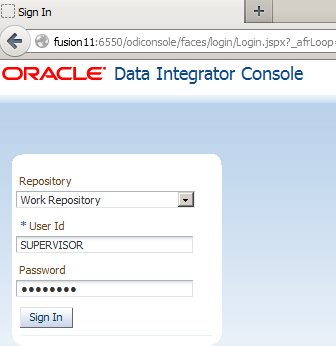 If you are not already aware the console is basically a cut down web version of the Studio and if you want to understand more about it then it is worth reading the section “Working with Oracle Data Integrator Console” in the ODI documentation. The security for the Console/Studio is independent of EPM security though it is possible to use external authentication and you can read through the fun and games I had setting it up in ODI 11.1.1.5/6 here, here and here. 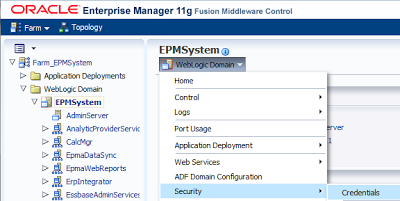 I have not yet configured ODI 11.1.1.7 (which is the version deployed with EPM 11.1.2.3) to use external authentication and it is my intention to go through and revisit the process to see if has changed and if so then bring it up to date in future blogs. The console does not have to be accessed directly and once the web server has been configured it should be possible to access it through that route. 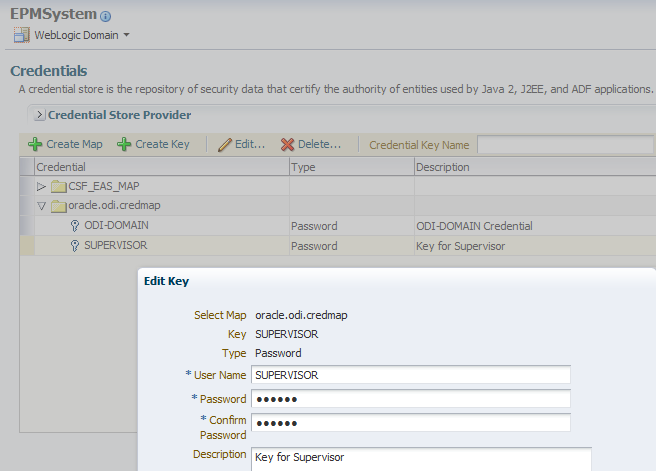 By default ODI is configured with only one user which is SUPERVISOR and the password still reflects the company that Oracle acquired ODI from in 2006 which is SUNOPSIS, in my opinion using a default password poses a security risk so I recommend updating the password straight away. So where is this file, well unless I am mistaken it doesn’t seem to exist and at first I thought all the ODI installation files do exist within the EPM install files but it does not seem to be the case. Within the odi directory there are installers for both Windows and Unix (check the ODI support matrix for more information on supported operating systems for Studio) type systems. I thought great it should be possible to install the Studio but once the installation commences you will be hit with a number of file not found errors and if you choose to continue through them the installation will complete successfully but there will be no Studio installed. Alternatively you can download the full ODI installation under Fusion Middleware 11g which is the route I took as I already had the files downloaded though the install process is exactly the same for either download. Once all the files have been downloaded and extracted. At the Installation Type stage "ODI Studio" should already be selected. 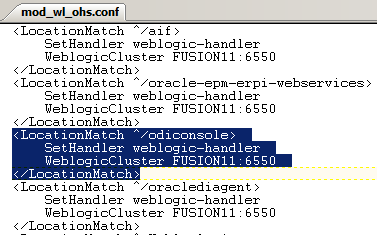 The Oracle Home Directory will be pointing to a location outside of the EPM installation which is perfectly fine to install to but as ODI components have already deployed I think it makes more sense to point to the existing home directory. The warning says upgrade but as the versions should be currently the same I don’t believe it poses an issue but this might need further consideration in the future if FDMEE patches have been applied. 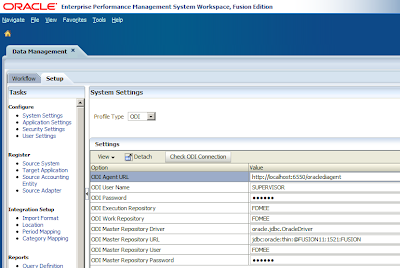 The next screens are for the configuration to ODI master repository which is part of the FDMEE database so that is where the database connection details should be configured to. If the connection information has been entered correctly along with the supervisor password then the FDMEE work repository should be populated. The Studio should now be available. The repository connection information should all be automatically populated from running the Studio installation. The SUPERVISOR password can be changed and once this has been done the ODI setup in FDMEE will need to be updated with the new password. 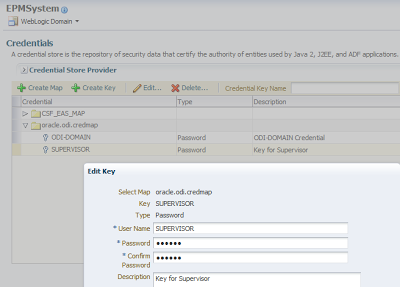 The ODI Java agent and Console also have the supervisor password stored in the Application Server credential store which is used to connect to the ODI master repository. The password can be updated by either using the WebLogic scripting tool or through Enterprise Manager. Edit the SUPERVISOR key and update the password then you should be good to go. 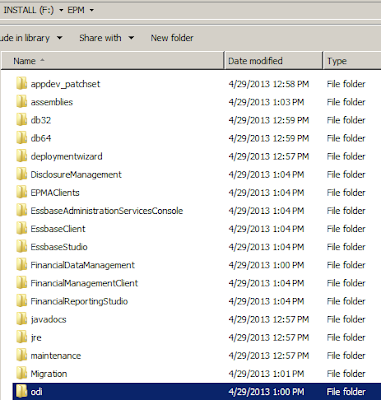 Now deploying FDMEE certainly does make life much simpler than all the steps that were required to get ODI up and running with ERPi but there is still room for improvement. Import metadata and data from a relational data source. I blogged about the 11.1.2.2.300+ features in three parts which can be found here, here and here. I double checked and the ability to export metadata to a relational data source was not available in 11.1.2.2.300 so I thought it would be worth going through this new piece of functionality in 11.1.2.3, now in my previous blogs I covered some areas such as using a command properties file which I am not going to cover again so if you have not done already it is probably worth having a read through the three previous blogs. The outline load utility has certainly become a powerful tool over the years since its first appearance in the early days of version 11, the only feature missing with relational data sources is the ability to export data (only to a file at present) though I am sure that functionality won’t be too far away. Anyway before jumping in and exporting metadata then there are a number of new parameters available which need to be understood, many are similar to the ones used when importing except the parameter contains an E (export) instead of I (import). This parameter defines the properties file which will hold all the database connection information for the export, it is the export equivalent to the /IR parameter which I previously covered and is used for importing. 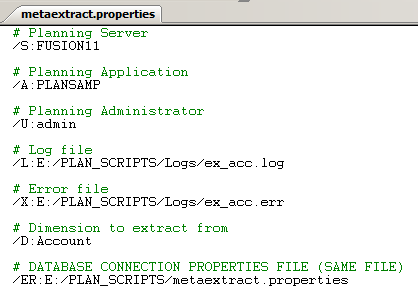 If you don’t specify the /ER parameter then you can use the /ERA parameter which basically uses the same database connection information as the planning application that the export is running against, personally I would want to keep import/export type data separate to the planning application database. This parameter I don’t believe is important if the database target is Oracle but for SQL Server it should be database name. This is the user name to connect to the relational database. The password for the database connection, this is unencrypted the first time it is used in a properties file and once an export has completed the file will have been updated with an encrypted version. This can either be the SQL export query to be run or it can be used to designate a key which will hold the SQL query, I will cover this in more detail shortly. So those are the main new parameters to use when exporting metadata and if you combine them with the existing parameters you should be ready to start putting it all together. 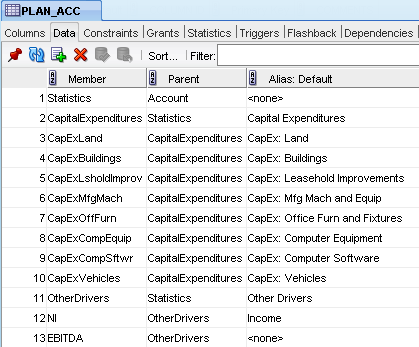 I am now going to go through a few examples of extracting account metadata from the sample planning application. First I start out with a batch script which will call the outline load utility and set the properties and password file to use. The –f parameter defines the password file to use and the /CP parameter defines the property file to use which will hold all the remaining parameters. The /ER parameter defines the database connection properties file and instead of using two property files I have pointed them all to the same file. 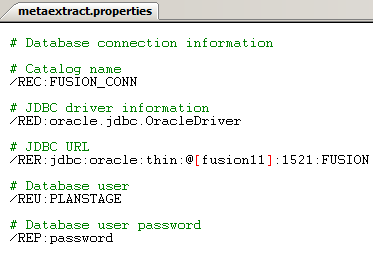 I am extracting to an Oracle database and the PLANSTAGE schema. As explained earlier the password used in the /REP parameter is not encrypted at first. Once the utility has been run the file should updated and the password encrypted. Now on for the most important parameter /REQ which defines the SQL query or key. The export query follows a strict format so don’t be thinking you can write your own elaborate SQL. <tableName> is the name of the table into which the exported metadata will be inserted into. (column1, column2, …) is an optional list of column names the metadata will be inserted into. 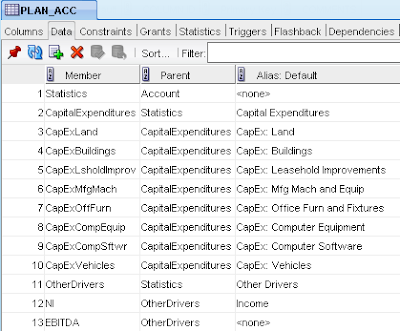 (property1, property2, …) are member property names to be extracted. So let’s take a simple example and extract the member and parent information. Instead of specifying the dimension name like you would normally when using the utility you use “Member”. The query will extract the Member and Parent values and insert them into a table called PLAN_ACC, the number of columns in the table will need to match the number of properties being extracted. The name of columns in this case does not matter just as long as there are the same number of columns, the order of how they populated is defined by the query so in my example “Member “ then “Parent”. 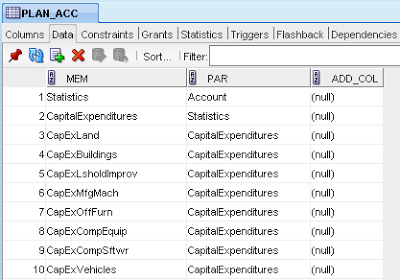 Before running make sure the table and columns have been created as the utility will not do this and fail. If the table has been created correctly then the export should be successful and the table populated. It is worth pointing out that the table will not be cleared out before the export runs and unfortunately it doesn’t look like there is an option yet to do so, hopefully it will be added in the future as all it will require is another parameter with a true/false option but until then you will need to clear out the table with your own preferred method. If the table has additional columns then you can define which columns to insert to in the query. Once again make sure the table has the same number of columns as properties that will be exported, if you are not sure how many columns are required then just run the script and check the output log as it will display all the properties that are being exported. When the correct number of columns has been defined in the table the export should be successful. There is another nice piece of functionality which allows you to export member properties based on the columns in the target table. The column names must match the properties in planning. 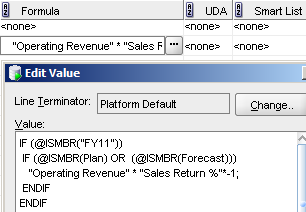 In the query the <columns> option can be used. When the export runs the utility will check the columns in the target table and then match that to the properties to export. So there we have it yet another great additional to the Outline Load utility.